There, their and they’re – there’s nothing to it! My article earlier in the week about the difference between ‘affect’ and ‘effect’ garnered a couple of comments from readers, which was very nice. Particularly as they were both complimentary. One of them however, contained a heartfelt plea for me to: “rid the world of the incorrect use of ‘there’, ‘their’ and ‘they’re’“. Well, I’m not sure I can promise to do exactly that, but it did get me to thinking, And as I have been pondering for a while what kind of articles I should include on the site, I decided that a series on the importance of accurate English might be useful. But in the spirit of Just the right words, I wanted to make it a little different. Quirky, with a dash of creativity. There, their, they’re – don’t despair! 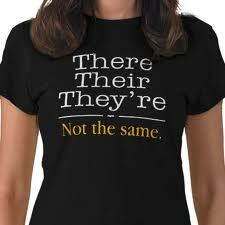 a jot about the difference between there, their and they’re. causes groans of disbelief and murmurs of reproach. when it comes to being accurate they’re simply laissez-faire. for how it makes us others feel. It isn’t even hard! Or use it with the verb to be, as in ‘there is your face’. so their mistake to spell it ‘there’ is quite an indiscretion. To use that one instead of ‘there’ drives people to distraction. a way of being accurate with there, their and they’re. Funny poem. Using the wrong there, their, they’re bugs me, too, so I hope this takes care of the problem once and for all! Thanks Janna – I’m glad you liked it. If I can help a few of those people who get it wrong to be able to start getting it right, and make a few of those who get irritated by it smile, I’ll be happy! Thank you kind sir, I’m glad you liked it. Though of course I can’t claim any credit other than for deciding to use the photo to illustrate the article. Nice of you to stop by – I’ve checked out your blog and I’m impressed. I’ll be back to read some more. Keep writing – I’m sure you’ll have your book advertised on the site one day! Thanks Jacey – it is pretty cool isn’t it. Might just have to invest in one of those. And if the poem doesn’t work I’ll just have to wear it until people start to take notice. Or run away! There, their, they’re . . . You are the Savlon and fabric plaster of inappropriate word use.